Since their first minting in 1986, American Eagle Silver Dollars have become one of the world's most popular silver bullion dollars. As genuine legal tender, these silver dollars are the only silver bullion whose weight and purity are backed by the United States Government. The 2019 American Silver Eagle Silver Dollar Coin is a favorite for any collector. This coin is .999 pure fine silver and offered in never-circulated condition. The obverse (heads) features Adolph A. Weinman’s full-length figure of Liberty in full stride, enveloped in folds of the flag, with her right hand extended and branches of laurel and oak in her left. The reverse (tails) features a heraldic eagle with shield, an olive branch in the right talon and arrows in the left. 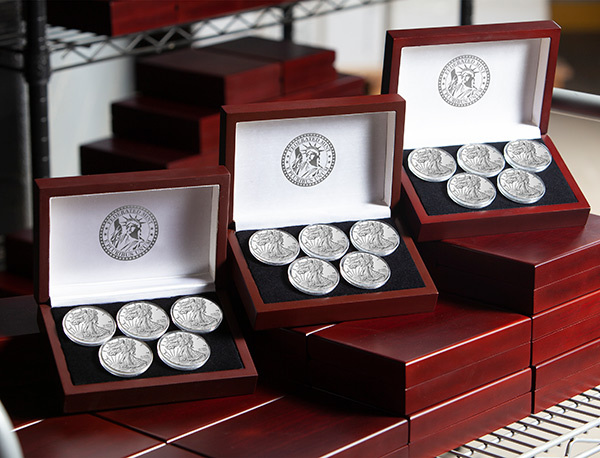 Each Vault Locker contains 5 Never Circulated 2019 U.S. Silver Eagles. Kept in these heavy Vault Lockers your collection is sure to stay safe and protected for years to come. Why Silver Eagles? Why Now?